If you ever get the chance to get to Bologna, do not leave the city without experiencing this incredibly beautiful art! Merletti e Ricami della Aemilia Ars is hard to find but worth the hunt. This is a reprint of the 1929 publication showcasing the masterpieces of the original Aemilia Ars Society. Text in Italian, tonnes of good black and white photos! L’Aemilia Ars di Antonilla Cantelli – A granddaughter's tribute to the maestra, showcasing her designs and laces. Text in Italian, lots of great photos. Aemilia Ars, Arts & Crafts a Bologna 1898-1903. Exhibit catalogue full of photos and the history of the original society and more. Text in Italian, difficult to find but well worth it. 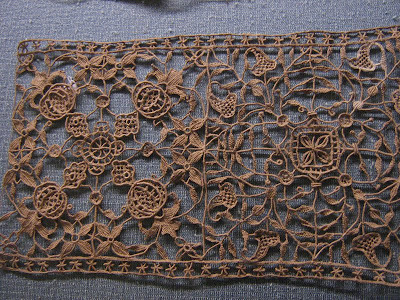 Old Italian Lace, Volume One by Elisa Ricci - downloadable in .pdf format from the Online Digital Archive of Documents on Weaving and related topics. Lots of black and white pictures and some history too! 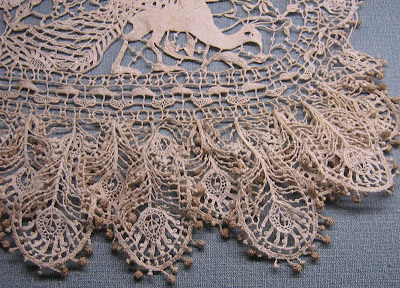 If you want to try your hand at this lace there are a few technical manuals out. For florals there is: Fiori - Quaderni di Aemilia Ars - Nuova S1, 2009. The text is in Italian but the book is packed with step by step clear photos. For geometric designs, there are a couple to choose from here. These texts are in Italian and English with lots of diagrams. There is also an exhibition catalogue with historical info and pictures. If you've got the May/June 2009 edition of Piecework, there is a small project there. 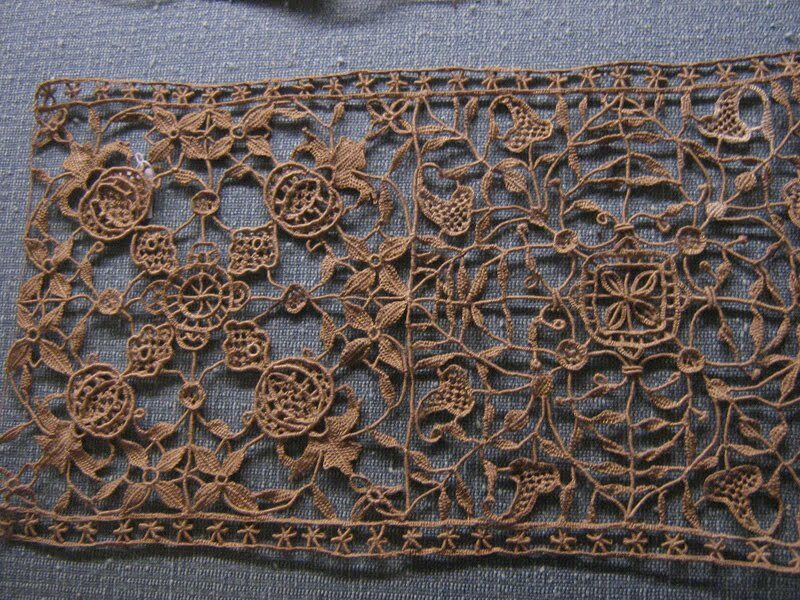 To learn more about Aemilia Ars needle lace, visit Tuttoricamo (click on the British flag for the English pages, there are articles under both the "History" and "Techniques" headings. While you're there check out "Prominent Characters": Antonilla Cantelli, Virginia Bonfiglioli and Christine Bishop for even more photos and info. Check out the book reviews to help you make a decision! Aemilia Ars needle lace is one of the most breathtaking laces I've ever seen. 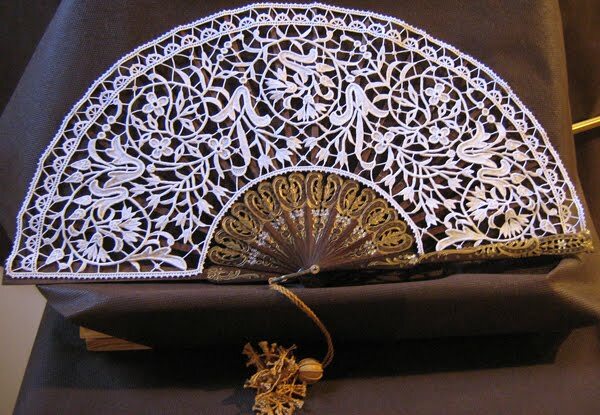 Conceived in Bologna, Italy at the end of the 19th century, it is made by building a structure of supports with thread, covering them and filling in the spaces between; working on cardstock and later inserting the lace into the finished artifact. The principal difference between this and other applied needle laces is that it makes use of a system of support stitches which are then cut away enabling the execution of some pretty amazing designs. 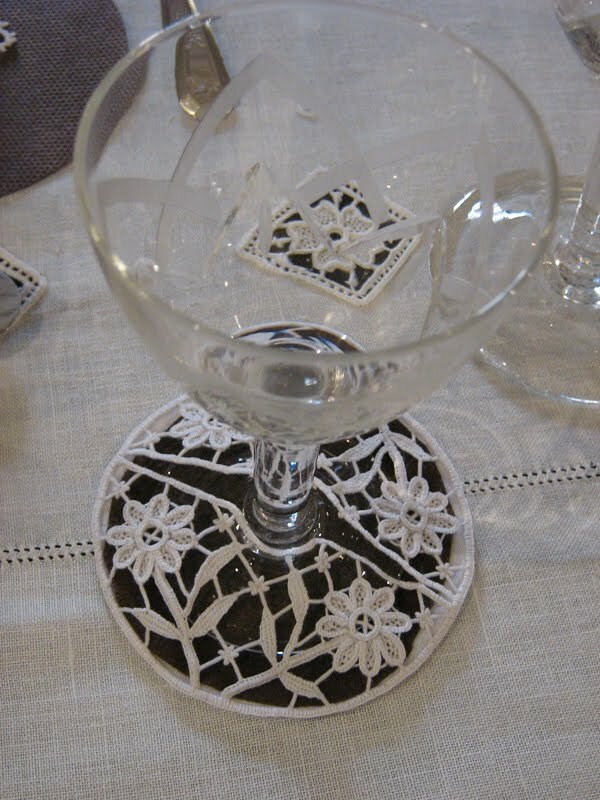 In 2007 I went to the Italia Invita Lace and Embroidery Forum in Rimini, Italy and took a three hour workshop on Aemilia Ars needle lace while I was there. Needless to say, this kind of beauty takes time and much practice! 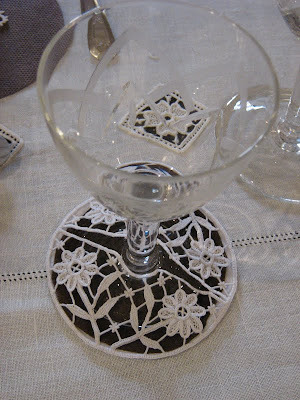 I'm not showing you the 'lace' that I made, but I will say that it did ignite my curiosity! Last year I went for the 2009 Forum, this time it was in Parma, and afterwards I went to Bologna in the hopes of seeing some of this lace up close. What I saw left me awestruck and literally brought tears to my eyes. Two very generous ladies met me at the train station and took me to the Collezioni Comunali d’Arte Museum which has a small but unbelievable collection of pieces. I say the collection is small because when you walk into the room there are (if I remember correctly) only five glass cases with the lace inside. 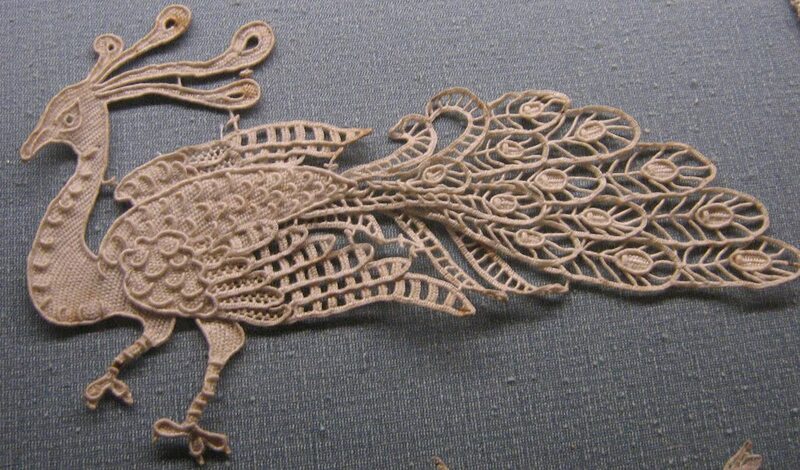 However, to study the individual pieces would require many, many visits as they are all very intricate and the more you look, the more you observe. Our nice attendant was replaced by one who was not so crazy about us taking photos so if you go, be prepared to be refused. If you're interested in this lace and you're in Bologna, you could study these pieces everyday and never get tired! 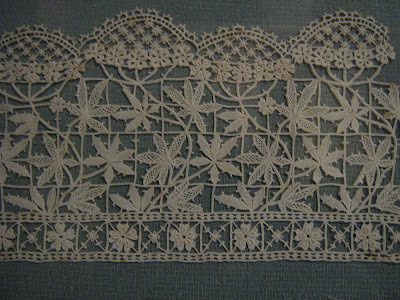 To learn more about Aemilia Ars needle lace, visit Tuttoricamo (click on the British flag for the English pages, there are articles under both the "History" and "Techniques" headings. While you're there check out "Prominent Characters": Antonilla Cantelli, Virginia Bonfiglioli and Christine Bishop for even more photos and info. 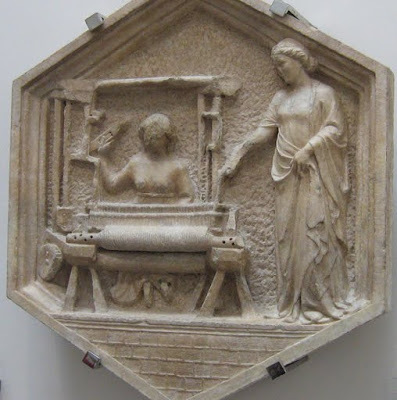 Tomorrow I'll tell you about the second half of that day in Bologna and some books on the Art of Aemilia Ars needle lace. If you've got some time and want to see needlework while you're in Florence, you should definitely hit a few museums. There are many to choose from and I will admit that I haven't been into half of them, so I can only tell you about what is in the ones I've seen.At the Duomo [Cathedral] there is the Museo dell'Opera del Duomo which houses the incredible collection of Or Nué (Silk Shaded Goldwork) in the Sala d'Altare [Altar Room]: some 20-odd panels depicting the life of St. John the Baptist. 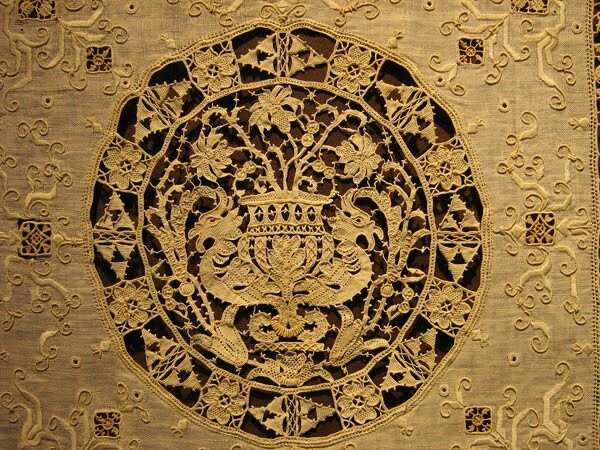 The designs for these absolutely amazing embroideries are attributed to Antonio and Paolo Pollaiolo, and the work is some of the best surviving examples of Florentine Goldwork from the Renaissance. Don't miss other embroideries along the wall opposite to these treasures, it is easy to be overwhelmed by the mastery of skill! The Galleria di Costumi [Costume Gallery] at the Palazzo Pitti is a great place to see embroidery of all kinds used to ornament different styles of dress down through the ages - and in theatre clothing as well. Don't leave without checking out the funeral clothing that has recently been restored of the Grand Duke Cosimo de'Medici, his wife Eleonora di Toledo and their son Don Garcia. After many years of being closed for restoration, the Palazzo Davanzati is a needleworker's dream. 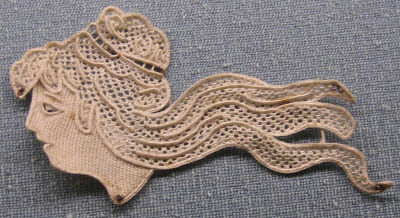 It houses a small but impressive collection of the finest needle lace and other techniques of laces and embroideries. Many pieces that are pictured in Elisa Ricci's books can actually be seen up close here. One room houses some textile equipment like a spinning wheel and many other tools, on the wall are several samplers of various techniques including one spectacular sampler of Reticello. Don't miss the cabinet in this room (it's quite dark in there) which holds many pull-out panels (remember to look on both sides of every panel!) and drawers containing a myriad of different embroideries and laces. The next room is better lit and is full of needlework including some very intricate pieces of Aemilia Ars needle lace from Bologna. Remember to pull out all the drawers in the cabinets in this room to see everything! Museums I haven't been to, but want to investigate in Florence are: the Bargello Museum which houses one of the famous Guicciardini trapunto quilts (the other one being in the Victoria and Albert Museum in London) and the Loretta Caponi Museum (on the website look under the smaller heading "Loretta Caponi" and then "La Collezione Loretta Caponi" to start a slide show of pieces). You can learn more about Aemilia Ars, Reticello and Goldwork (Metal Thread Embroidery) at Tuttoricamo, (click on the British flag for the English version then 'Techniques') - while you're there look under 'Prominent Characters' to learn more about Elisa Ricci and under 'History' for the Guicciardini quilts. I'd love to hear from you if you've discovered other needlework in Florence - please leave a comment below! 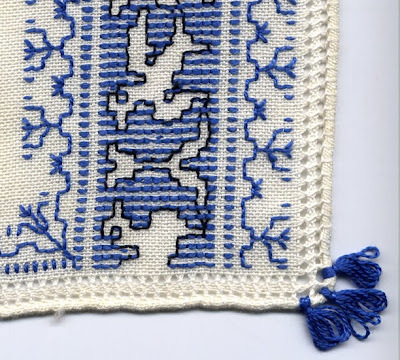 As can happen with many different stitches and embroidery techniques, there are different ways to execute a stitch. This can depend on the country where it is being done, or in the case of Italy: the region or even the town. Some associate the Gigliuccio's origins with Tuscany where it is the traditional edging of Punto Antico which some also associate with Tuscany, but in truth it is done all over Italy. Some call the Gigliuccio the Fleur des lys stitch and associate it with Florence and the lily. 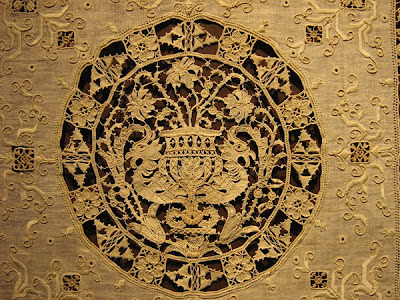 Some associate it with the Gigliucci family of Fermo, Italy where it is said there is evidence of the stitch as far back as the end of the 1600s. We might be safe to say it is definitely an Italian stitch from the region that became Italy in the late 1800s – because technically Italy was not officially "Italy" before the Unification. I say 'might' because when I did finally find something that looked like the Gigliuccio I'd seen in RAKAM, it was in a Schwalm book by Renate Fernau and it was called the Peahole Hemstitch. 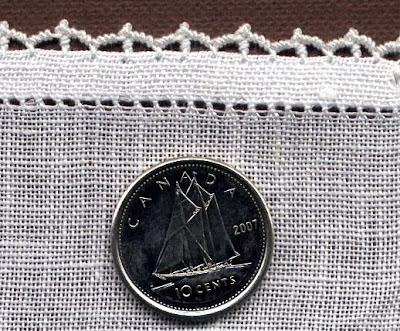 Basically it is a Drawn-Thread technique consisting of groups of knotted bundles in an open channel between two rows of Four-Sided Stitch, also known as Italian Hemstitch. There is a tutorial for executing it on the right side of the fabric here, and a two-part tutorial for using it to secure a hem, executing it on the back side of the work starting here and ending here. There are many different ways to execute the Gigliuccio hemstitch, you will need to try a couple different ones (I'm sure there are other methods that I haven't yet discovered) to see which one you like best, regardless of the technique used to make it, the result is a beautiful openwork channel which plays with the effects of chiaroscuro and is very pleasing to the eye. It can be done in tone-on-tone, in light-coloured thread on dark fabric or dark-coloured thread on light fabric: each gives a different effect. Done in multiple rows at a hemline, or in a single row to connect the motifs of a tablecloth, or however else you can imagine it, it is always attractive. Do a Google image search for some inspirational photos! I'll admit that I'm very much attracted to different types of hemstitching. Usually instead of flipping over embroidery to look at the back like other stitchers do, I feel around for the edge to see how it has been treated. 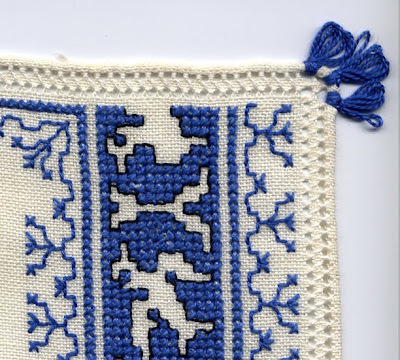 Italian needlework feeds my craving for hemstitching in all kinds of fascinating ways. There is so much creativity and imagination! Oh, I could go on and on! And I probably will in another post. For now I'll leave you with some books to check out. Punti a Giorno (Decorative Hemstitch) Vol. 4 by Giuliana Buonpadre. My copy is in Italian but I understand that you can get copies also in either French or English. All of her books are very clear with diagrams and photos of each stitch. I Miei Sfilati (My Drawn Thread Works) by Antonietta Monzo Menossi. More complex combinations but really beautiful work, text in Italian and English. You can get this one at Tombolo Disegni (click on: Libri/Books, Libri-Ricamo, Ricamo Italiani - scroll to the bottom of the page). For the Gigliuccio (known in English as the Peahole Hemstitch) or for the Cat's Tooth (together with lots of other great hemstitches in a booklet called: Hems and...) send an email to Italian-Needlecrafts who is the overseas reseller for these fantastic books. Long ago and far away I wandered the streets of Florence looking in vain for a needlework shop that someone had told me about. Never mind that I didn't have a map, the directions were... go to the Duomo, face the Baptistry, in the left corner of the piazza take the road called Borgo San Lorenzo, it turns into Via de' Ginori... walk until you get to number 23. Well, frustratingly I couldn't find no. 23. The addresses completely skipped over the 20s on the odd numbered side of the street. I never found the shop, though I wandered up and down the street, peering into all the shops that were open. More frustrating was the fact that I had seen some painted canvases with Florentine scenes on them in a window while I was wandering around and thought "oh, I'll come back here on my way back and take a look", but I didn't take note of the address or even the street name so of course I never found my way back. Note to self: don't do that again. If you see something you like, go in right away and look at it because even if you do miraculously find your way back, the shop will inevitably be closed for lunch. Most shops are closed from 1 - 3 pm. Last year in May, I took one of Vima diMarchi Micheli's fantastic needlework tours of Italy. If you ever get the chance, you should do at least one of these in your lifetime. Vima knows all kinds of interesting shops in Florence... and other cities too! She took us to lots of places but my favourites in Florence were: Casa dei Tessuti in Via dei Pecori, no. 20. What a fabulous fabric shop! Passamaneria Valmar in Via Porta Rossa no. 53. An amazing passamaneria shop with tassels and buttons, and trims and braids and cushions and more! Right next door at no. 51 is Bruno Falugi a store where you can buy needlework fabric and threads and household linens. I went back every day we were there and bought more. On our own, my roommate and I stumbled across Ricamo e Cucito in Piazza dell'Olio, no. 8. Lots of cross stitch and needlepoint but mostly American and English stuff you've already seen on the internet or in stores at home. They did have some Italian and French patterns which were interesting and some lovely work on display. With Vima we also visited the Scuola del Cuoio, in the Monastery of Santa Croce, Via S. Giuseppe, no. 5. Breathtaking leatherwork - purses, wallets, home decor stuff like frames and desk accessories, cosmetic accessories holders... just an incredible display. If you go, do not miss the handbag display - each one is an individual creation hand-decorated by a very talented lady. There are some special places to look at needlework in Florence but I'll save that for another post! This is one of the hexagonal carvings from the face of the Duomo... now kept inside the museum. The books I have on Assisi Embroidery vary from just pattern books to ones with historical information on the technique and the area it comes from. I started out with Ricami d'Assisi [Assisi Embroidery] 2 and 3 published by Mani di Fata. I hand-wrote a letter and mailed it to them requesting the two books that I'd seen in an edition of an Italian embroidery magazine, probably RAKAM. (By the way, those of you in the U.S. can order a subscription to RAKAM from Amazon) They wrote me a letter back stating that I could order from them only if I followed a long and complicated list of instructions which required photocopies of the front and back of my credit card, identification, etc. We're talking about 10 years ago or so... when the internet was nowhere near as sophisticated as it is today. I actually faxed my info to them and waited months for my books to arrive. Thankfully life is not like that anymore! Later I discovered Punto Assisi, Editrice Minerva, 2001. The blurb said it was in Italian and English on whatever website I bought it from, however I was disappointed to find that only the technical directions were translated (there is German and French too!) and the whole history section was not. I know it was recently reprinted (2007) with some updates but I don't know if the history text is now translated or not. If someone out there knows, will you post a comment? The older edition has a blue cover, the newest edition has the same pattern but it is in red. The collection of patterns in this book is quite extensive, from little patterns to big ones, central designs for tablecloths and borders galore – traditional Italian designs with all kinds of strange animals (my favourite!). The bibliography is extensive and helpful to those seeking more information. This book is well worth the trouble of hunting it down. An interesting book is the Variety Book No. 4, Carmela Testa Co. Inc., 1925. This is all in English with great close-up photos. This book also has quite a lot on hemstitching, showing how to stitch the rolled hem and withdraw threads for open work. If you're lucky enough to find this on Ebay, grab it! Otherwise you can get a restored copy from Iva Rose in the U.S.
My absolute favourite Assisi Book is Il Punto Assisi by Raffaella Bartolucci Cesaretti, 2004. It is a hard cover book loaded with great photos of existing embroideries. The text is in Italian and extensively recounts the history of the technique and those who practiced it over time. Symbology and designs are explained and there are about 10 pages of designs, some very complex! The bibliography is extensive. I wrote to the author directly to get my copy and sent her a money order (back when it first came out) but I have seen it turn up on searches at alibris.com and abebooks.com from time to time. I have Old Italian Patterns for Linen Embroidery by Frieda Lipperheide originally published in German in 1892, this edition was translated into English by Kathleen Epstein in 1996. This is a lovely collection of patterns. Not really a book but a collection of folios. It is beautifully presented and the folios are easily used when stitching. 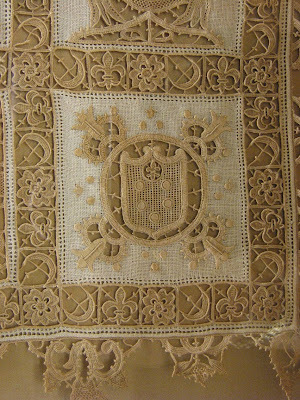 It has historical information on Italian Embroidery in general and encompasses other techniques besides Assisi Embroidery. My latest acquisition is just a pattern book but I'll mention it as it is interesting. The patterns are a collection of the last 10 years of research by the Accademia Punto Assisi. They have painstakingly recorded patterns from pieces of embroidery from the trousseaux of local women. The collection is spiral bound with a sturdy cover that folds out so that you can stand the book up on a table top when you're working! Mad Samplar Books in the U.S. has a great selection of books on Assisi Embroidery. Of all the types of Italian needlework, Assisi Embroidery is probably the most recognized by non-Italians. That is, most embroiderers are at least conscious of it, if they haven't done a bit of it themselves. It is a very attractive counted thread technique that dates back to at least the 13th century, if not before. There are a number of books on the market, some with traditional designs, some with more modern ones. I have quite a few. In my listing of the books that I have, I didn't list all the strictly pattern books, nor all the electronically scanned out-of-print and out-of copyright ones. I honestly have to stop myself from automatically buying a book on Assisi embroidery every time I come across one that I don't already have! Almost 10 years ago I bought a yard of 28 ct 'Assisi' Graziano Linen from the US. By the time I factored in the exchange rate between the Canadian and American dollars (the Canadian dollar was not doing as good then as it is now) and the shipping, my yard cost me nearly $200 Canadian dollars. I'm happy to say that it is now easier and much less costly to have this lovely linen. And lovely it truly is! 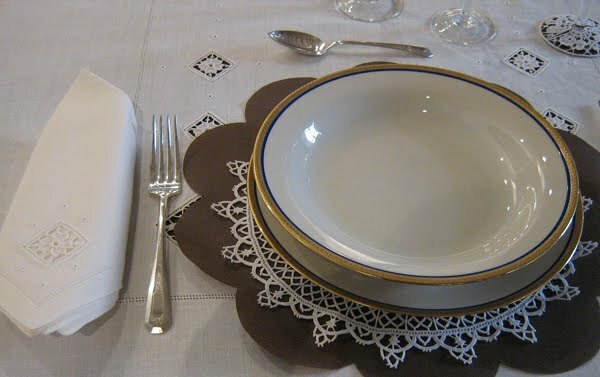 The threads are nice and plump and the fabric is weighty so that it makes great tablecloths, placemats, napkins, centres, doilies, you name it! Traditional Assisi Embroidery is stitched on off-white coloured Assisi linen in either blue or rust coloured embroidery floss. The cross stitch can be regular x's or long-armed cross and the 'x' part should be made over three fabric ground threads. I've made a couple f scans of a piece that was a gift to me, made in Assisi. Outlines of the design are done first in a darker floss, black or dark brown with the Double Running Stitch. 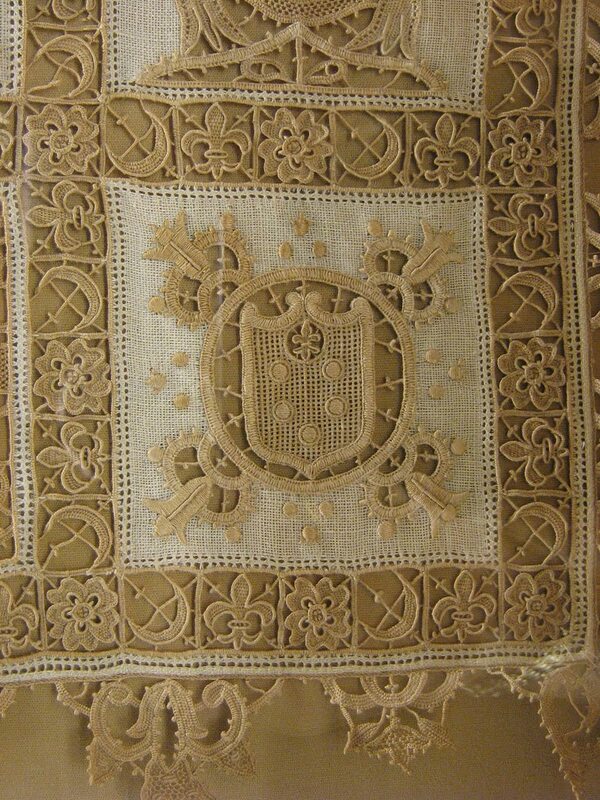 The fretwork is also executed in Double Running Stitch. I love the combination of the voided work and the fretwork along the borders but most of all I love the hems! Four-Sided Stitch (done on this piece in off-white no. 8 pearl cotton) runs along the hemline (withdraw one or two ground threads for a more open effect) and the edge is finished with a rolled hem. 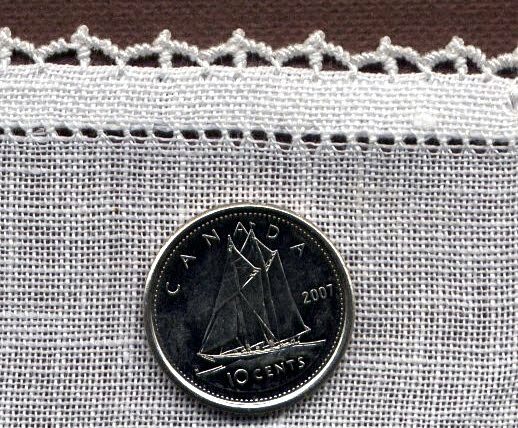 I'm sad to say that I have never quite been able to achieve a rolled hem this small (or this neat!). The trick, I was told, is to wet your fingers with saliva and roll the fabric as you stitch. Here is the back of the same corner, notice how far into the rolled hem the hemstitches go in order to keep the roll in place... almost far enough to be seen from the front. Of course I also love the tassels! Traditionally in groups of three, these tassels are made of no. 8 pearl cotton thread. The Anchor Manual of Needlework, which has quite an extensive section on Italian Needlework, has instructions on how to make these great little tassels. You can read more on Assisi Embroidery at the Italian needlework website TuttoRicamo, click on the British Flag for the English pages and look under 'Techniques'. While you're there, you can download an old book on Assisi Embroidery from the early 20th century in .pdf format. Click on the first link under the 'Books' heading in the Assisi article, this will take you to another page. Under the first heading of 'Adele della Porta' you'll see the link. There are some great fantastical beasts in that book. Okay, so this isn't Needlework per se, however it is Italian and stitching-related so I'm bending my own rules already. Also, I guess I should have started my alphabetical listing with this one... but hey, I'm new to this and not quite as organized as I'd like. 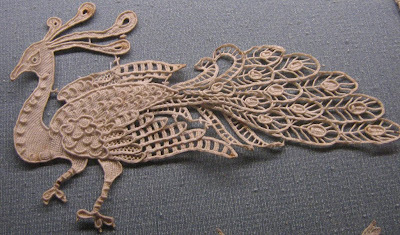 Aquila Bobbin Lace, or Tombolo Aquilano originates in the surrounds of Aquila, Italy. I've been thinking about them a lot lately as it's been almost a year since the devastating earthquake of April 6, 2009. The press seems to have forgotten all about those people living in tents, but I haven't. The tales of Aquila lace date back to the 1490s when Queen Isabella, the wife of King Ferdinand I of Naples visited the city and greatly admired the particular beauty of the local lace. Since Elisa Ricci tells us in her Old Italian Lace (1913) that the first signs of lace are in frescoes at San Gimignano dating to about 1465, then perhaps it's possible that Aquila lace is indeed so ancient. 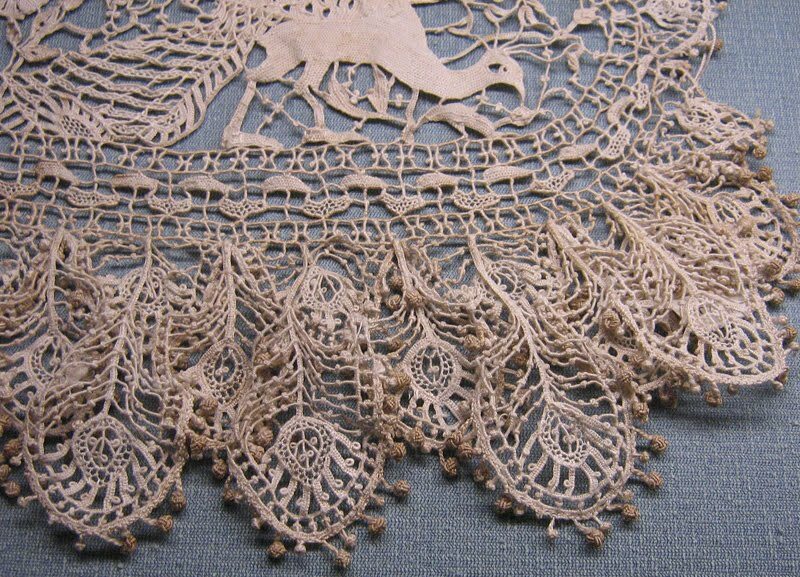 In any case the beauty of this lace is undeniable. 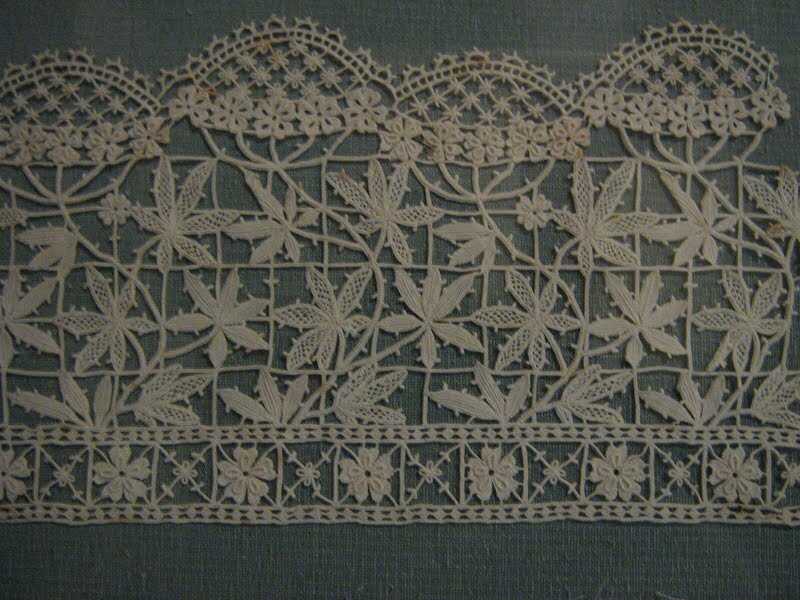 It is classified as a continuous filament lace worked in very fine linen or silk thread. It can be worked with a great number of bobbins, adding and subtracting as the work continues. With the 'ancient stitch' patterns of alphabets, butterflies, flowers and ribbons can be made, while with the 'new stitch' (created in the 19th century) geometrical designs are created. Some pictures of both ancient stitch [punto antico] and new stitch [punto nuovo] can be seen here at Le Mani d'Oro [Hands of Gold]. You can read more about Elisa Ricci at the Italian Embroidery website Tuttoricamo, click on the British flag for the English pages and look under 'prominent characters'. So, let's start at the beginning of the alphabet as I am lacking in imagination at this moment. Aquileia Embroidery is a relatively 'new' technique; that is, the fabulously talented maestra Antonietta Monzo Menossi of the Italian Needlework school Ricami e Legami in Udine, Italy was inspired by the mosaics of Aquileia and wanted to reproduce them using embroidery stitches to commemorate the third millennium. The technique is composed mainly of groups of Satin Stitches arranged to imitate mosaic tiles, Whipped Chain Stitch for outlines and Rodi pulled stitches for background filling. 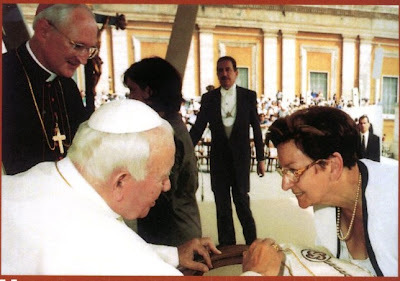 Some information I found in English goes as follows: "With this embroidery a stole was produced [and] donated to his Holiness on the occasion of the Jubilee 2000, a set of sacred vestment[s] for the Archbishop of Udine and a triptych which transfers the classic patterns of the floor of the basilica of Aquileia given to President Ciampi and his wife." I have a book called: Gioielli d'Ago which showcases Signora Menossi's work and that of her also very talented sister AnnaMaria Monzo Veronese in Aquileia Embroidery as well as other techniques like Hedebo and Needlepainting. 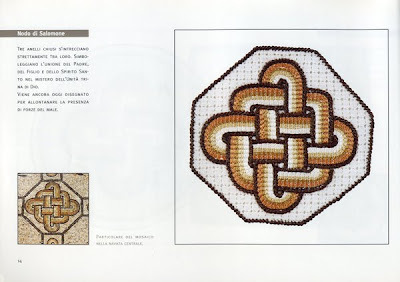 Although the text is in Italian only, this book has lots of pictures of how to execute the various stitches (quite an extensive section on Hedebo), and is a treat for the eyes (I love mosaics!). This book can be purchased online from Tombolo Disegni, click on 'Libri/Books', then 'Libri Ricamo', then 'Ricamo Italiani' to get to the right page and scroll down. To order from this website you must click on the side bar at the right 'Come ordinare' and send an email request to the email address listed there. Copy and paste the info about the book you want so there is no misunderstanding and Gianfranca the owner will send you an email PayPal request. You can read more about the Monzo sisters on the Italian Embroidery website TuttoRicamo, click on the British flag for the English version and then look under 'Prominent Characters'. While you're there, under the 'How its done' section is a tutorial for the Rodi pulled stitch (the article heading is: pulled thread work). Hello and welcome to my blog. After much humming and hawwing I have decided to start a blog in order to share all the wonders of Italian Needlework that I have found over the last 10 years of research. I aim to show you needlework techniques, books, kits, supplies, websites, and anything else I think you might be interested in. 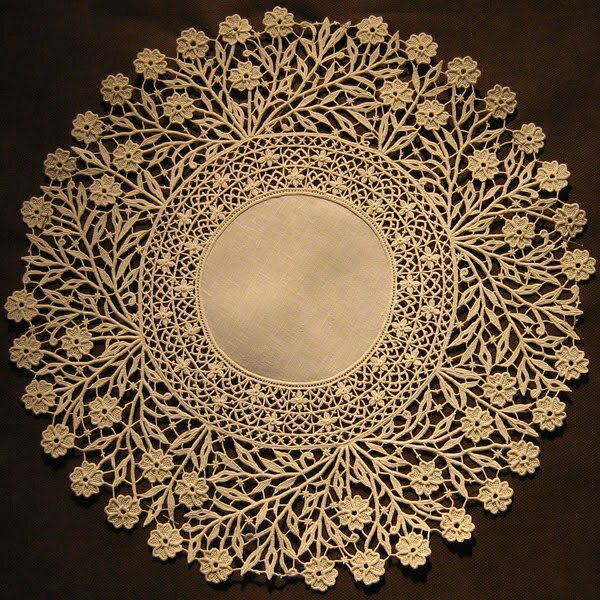 Please feel free to ask me questions about Italian Needlework and I will endeavour to find you some answers. Italian Needlework is my passion and I have been researching it for the last decade with the hope of bringing it to light for English-speaking embroidery enthusiasts who might not otherwise know of it or be able to find it. Until very recently it has been difficult to find, the language barrier is always an issue and techniques were traditionally handed down verbally without much enthusiasm for writing anything down. However as women went to work and had less time to stitch, techniques and know-how have been lost. Recently Italian needleworkers have started to publish books, manuals, kits and start websites about the embroidery that they love and now there is a wide range to choose from albeit most of the text is still only in Italian. 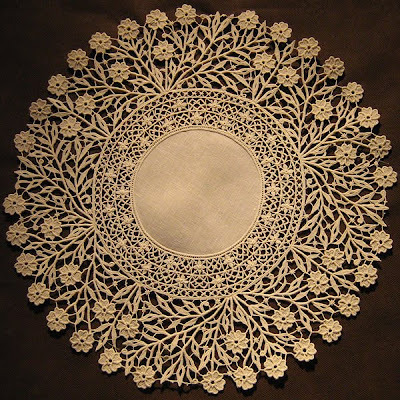 The trend now is for embroiderers and lace makers to show the world their art and they are making an effort to have things translated into other languages like English, French, German and Spanish. This can only mean good things for those of us who are curious to learn of the wonders of Italian needlework.